The late 1960s and early 1970s were a most fertile time in musical history, especially in the rock genre. While many of the seminal bands came from the UK, such as The Beatles, Cream, The Jimi Hendrix Experience, there were also incredible groups who originated in the United States. One hotbed of music was on the West Coast, with centers in San Francisco and Los Angeles in particular. One of the most interesting and talented of these ensembles was the quintet known simply as Spirit. 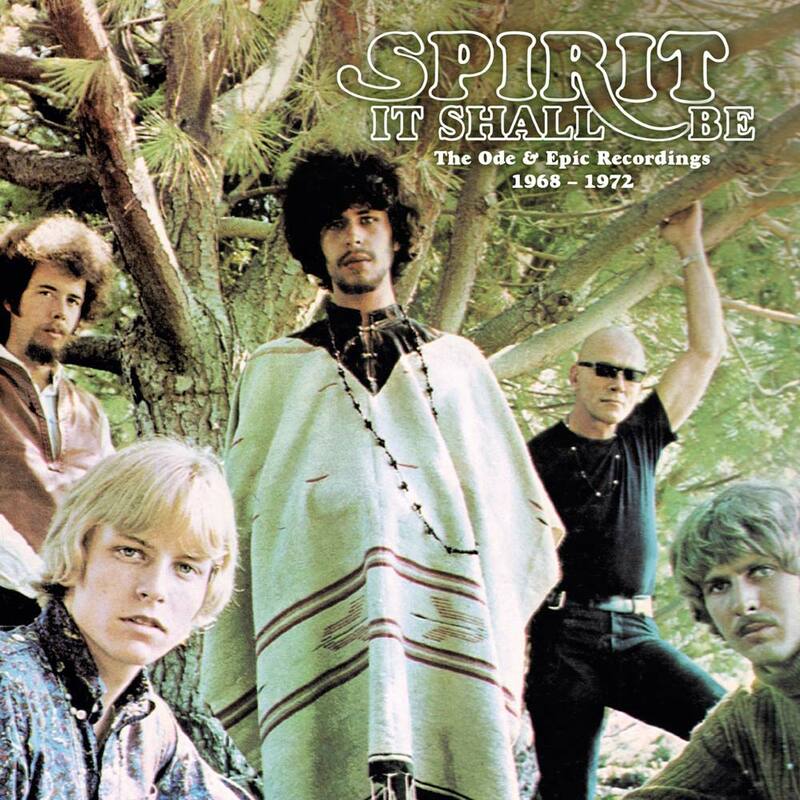 Between the years of 1968 and 1970, Spirit released four wonderful albums as well as a movie soundtrack that went unreleased at the time and some most interesting singles. Cherry Red Records, UK, has gathered these recordings as well as a 1972 album released by the band, albeit in a much different configuration, album outtakes, alternate versions, non-LP single sides and mixes done for the 1991 compilation “Time Circle”, the result being the simply sublime 5 CD box set “It Shall Be” which is reviewed here. Following a stint playing on the East Coast with Jimi Hendrix, guitarist Randy Wolfe and his family, including stepfather, jazz drummer, Ed Cassidy, relocated to the West Coast. Wolfe, under the familiar moniker Randy California given to him by Hendrix to distinguish him from bassist Randy Palmer who had been rechristened Randy Texas, formed a group calling itself Spirits Rebellious, taken from a book by Lebanese-American writer Khalil Gibran. The band’s name was soon shortened to Spirit, which under the management of Ann Applequist got some studio time at Western Recorders studio, where they recorded a demo produced by Barry Hansen, who later gained fame as radio DJ Doctor Demento. Spirit consisted of California and Cassidy as well as bassist/vocalist Mark Andes, keyboardist John Locke, and vocalist/percussionist Jay Ferguson. The seeds of the band dated back to 1965 when Cassidy and California had a band known as the Red Roosters, which included Ferguson and Andes along with keyboard player Mark Fondlier. While record sales were never the driving force of the band, the quality of their recordings certainly warranted far better results than the band achieved. The problem, sadly, was that the band was simply so talented and eclectic that they defied pigeon holing and with a sound that mixed elements of jazz, blues, psychedelia and rock, they never found a niche to spur the sale of product. They did, however, produce some of the most memorable recordings of the day, timeless documents that sound as fresh and relevant in 2018 as they did in 1968 when the group’s debut self-titled LP was released on Lou Adler’s Ode Records label. From the outset, “Spirit” sat the band apart with the opening track “Fresh Garbage” addressing the ecology, a subject beyond the realm of most of its contemporaries. The band also addressed the topic of technology in “Mechanical World” which would become the band’s debut single, bucking the industry standard of three minutes or less, released in its full album edit with a run time exceeding five minutes. The b-side was another track from the album “Uncle Jack” both songs penned by Ferguson. Other highlights of the LP are the gorgeous instrumental “Taurus” written by California, the band credited ode to their pursuit of a recording contract “Gramophone Man” and the extended album closer “Elijah” spotlighting the keyboard work of Locke. Peaking at #31 on the Billboard charts on its release in January, 1968, “It Shall Be” marks the first ever appearance of the LP’s mono version on CD, it being the only album by the band to see release in mono, with California and the rest of the band feeling mono was too restrictive for their sound. I will leave it to the ear of the listener to decide for themselves, although I tend to agree with California, despite the seemingly unquenchable thirst for music buyers for mono product. Disc one of “It Shall Be” is rounded out by the original 1968 stereo mix of the band’s sophomore album “The Family That Plays Together” the title a reference to the relationship of California and Cassidy. The LP’s opening track “I’ve Got A Line On You’ was lifted for single release and was the band’s only Top 40 entry, topping at #25 on the charts, backed by another track from the LP, “She Smiles” the a-side a California composition, the b-side by Ferguson. The single contains one of rock’s most recognizable guitar riffs and remains a staple of Classic Rock stations to this day, as well as receiving more than two million views on YouTube. The box set’s title track, a California/Locke composition, is the second track of the LP, a gorgeous tune with Locke’s keyboards to the fore, with Cassidy contributing nuanced percussion and California’s restrained, yet ever present fuzz guitar adding texture, a tribute to his ability and willingness to consistently contribute without over playing or showboating, a most admirable attribute. The album closer “Aren’t You Glad” would reappear, in a slightly different version, on the group’s soundtrack for Jacques Demy’s 1969 movie “The Model Shop.” “The Family That Plays Together” was the band’s highest charting album, certainly aided by the hit single, reaching #22. Disc two of the set begins with the twelve tracks from the previously mentioned movie soundtrack, although the recordings remained unreleased until 2005, appearing on the Sundazed label. The band’s third album recorded in 1968, “The Model Shop” contains ideas that had been previously released (“Aren’t You Glad”) as well as some that would appear on the band’s third official LP, 1969’s “Clear” with one tune, “Model Shop II” actually being subtitled “Clear” and would, serve, in re-recorded form, as the LP’s title track. At the time, however, the movie bombed and few people actually heard the music the band had recorded for it, despite the quality of tunes such as “Fog.” The disc closes with “Clear” a strong effort by the group opening with the haunting “Dark Eyed Woman,” which saw single release backed by “New Dope In Town,” while the band showed its lighter, breezier side on the delightful “So Little Time To Fly.” Besides the re-recorded and rechristened title track, the album closer, the fabulously titled, previously mentioned “New Dope In Town’ is another band composition with strong contributions by all members, from Locke’s gentle piano interlude to Cassidy’s tasty percussion and California’s fuzz guitar lurking in the background, once again not crowding the band’s sound or seeking the limelight “Clear” sadly stalled at #55 on the charts. Disc three opens with the band’s magnum opus 1970’s “The Twelve Dreams Of Dr. Sardonicus” an album that should have made Spirit a household name as well as rich and famous. Unfortunately, the album did not meet sales expectations, reaching on #63 on the charts, and its failure to sell resulted in disappointment and discord within the band, particularly between California, Ferguson and Andes, the end result being Ferguson and Andes leaving to form Jo Jo Gunne and California departing to take some time off, leaving Cassidy and Locke to carry on as Spirit. As for the music, “Sardonicus” opens with the hard rocking, California tour de force medley “Prelude/Nothing To Hide” which leaves the listener absolutely breathless. Why it did not receive single release has always been a mystery to me as it has hit written all over it. Instead, Epic chose the gentler, yet delightful “Animal Zoo” which was backed by the non-LP b-side “Red Light Roll On.” The single barely dented the charts, stalling at #97 and begging the question as to whether the choice of a different title would have spurred album sales, but that point is merely academic. “Twelve Dreams” a concept album, in the vein of “Sgt. Pepper” has nary a weak link, with familiar tracks like “Mr. Skin,” and the haunting tunes “Life Has Just Begun” and “Morning Will Come” driving the point home. Disc three closes with the tracks composing “Feedback” the album Cassidy and Locke recorded with Texan brother J. Christian Staehely and Al Staehely taking over on guitar and bass and contributing many of the LP’s tunes. While the album certainly has its moments, such as the opening tune “Chelsea Girls” it bears little resemblance to the band’s halcyon days with California and Ferguson, and died at #111 on the charts and marked the official death of Spirit’s original lifespan. Some may question the inclusion of “Feedback” on the box set, but it was indeed part of the band’s Ode/Epic discography and as such is a bona fide part of the band’s discography. Disc four opens with the mono version of “Spirit” previously mentioned. Long out of print, this release is a most welcome addition and will certainly be the center of many discussions as to which version of the album is superior, not to mention satisfying the long standing call by mono fans for its reissue. Next up are four outtakes from the debut LP, all of which were included on the 1996 CD reissue, but are found here in 24 bit rather than 20 bit mastering. The disc closes with four tracks from the 1991 compilation “Time Circle” highlighted by the then new mixes of “I’ve Got A Line On You” and “It Shall Be.” The former is most interesting and certainly welcomed by this reviewer, especially in its 24 bit mastered version found here. Disc five begins with eight tracks from “Time Circle” highlighted by “The Family That Plays Together” track “Dream Within A Dream” and the “Clear” version of “Aren’t You Glad.” Five tracks from “The Family That Plays Together” again included on the 1996 reissue appear, but in 24 bit mastered form. Next up are two outtakes from the “Clear” sessions, tunes not included on the original album, but on the CD reissue, “Fuller Brush Man” and “Coral.” The set closes with the band’s non-LP shoulda been a hit single “1984” and its non-LP b’side “Sweet Stella Baby” sounding better than ever, followed by the mono single version of “Animal Zoo” and its non-LP b-side “Red Light Roll On” sounding crisp and clean thanks to the 24 bit mastering job. The final track on the set is a mono mix of “Morning Will Come” a track from “Twelve Dreams” that would have been an excellent single choice. But, with it, this 5 disc, 108 track collection comes to a close. Wow! Compiled for Cherry Red Records’ Esoteric Recordings imprint, by Mark and Vicky Powell, “It Shall Be” comes in a clamshell box, with a 20-page full color booklet with complete track listings, an essay by Malcolm Dome, some choice photos and incredible sound thanks to the 24-bit remastering job by Ben Wiseman. Aside from perhaps a bit larger booklet, I can’t think of a single thing I would change regarding “It Shall Be.” This is, for this reviewer, the best reissue of 2018 up to its date of reissue, and is an absolute must for fans of 1960s and 1970s rock, jazz rock, psychedelic rock, Randy California or Spirit’s music in general. I can’t think of superlatives strong enough to stress the quality of this release or suggest it strongly enough. My advice? Get your copy now or forever live with regret!